Thirty-eight years after enrolling in one of Professor Edward H. Henderson’s philosophy courses at LSU, Don Broussard still remembers how it felt to explore life’s great questions for the first time. Broussard says he has never forgotten Henderson’s powerful, yet relaxed, ability to expose students to the world traditions of thought. 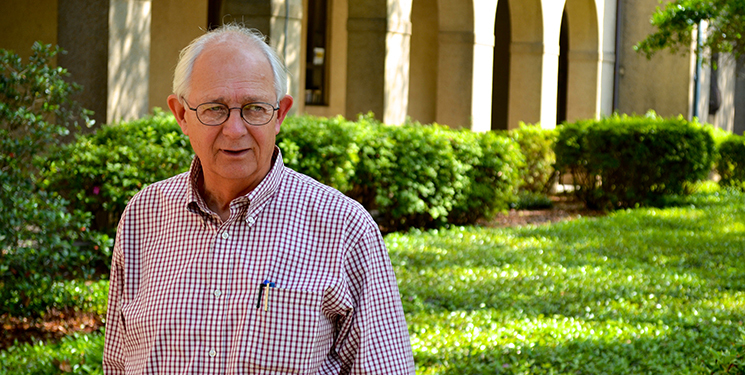 Henderson, a beloved professor of many LSU students, retired in 2012 after a 46-year career in the College of Humanities & Social Sciences’ Department of Philosophy & Religious Studies. There, he not only inspired his students in the classroom, but his enthusiasm for fostering learning also helped spawn the LSU Honors College. Francis Landreaux, a former student and graduate assistant who worked with Henderson in the philosophy department for several years, is leading an effort to establish an endowed scholarship in Henderson’s name, funded through the generosity of former students, colleagues and friends. With $20,000 given so far, the scholarship effort is halfway to the endowment level, which will enable the fund to perpetually benefit deserving Honors College students majoring in philosophy. Early in his career at LSU, Henderson helped create courses in the Honors Division, a new program that provided opportunities for high-level students during a time when LSU, like many state universities, lacked admissions standards. Henderson and a few other faculty members taught small sections of humanities courses. His sections included the great philosophers and the development of Western civilization. The Honors Division led to the establishment of the LSU Honors College, where Henderson eventually served as associate dean. “I really expect that many of those whose lives were touched by Ed will also want to contribute,” Landreaux added. Professor of Philosophy Mary Sirridge worked with Henderson for 35 years and says he was a natural at distilling complex concepts for a broad spectrum of students. No matter their fields of study, Henderson’s students walked away with a deeper understanding of, and a new appreciation for, philosophy and religion.